The Ancient Maya City of Calakmul, Campeche is one of the largest ancient Maya cities ever uncovered, with many objects like stelae, murals and burial tombs still in situ. The site contains 117 stelae, the largest total in the region. It flourished between 400 BC to 900 AD, which makes it older than the other inscribed Maya sites. Afterwards the center of Maya power shifted to the north. 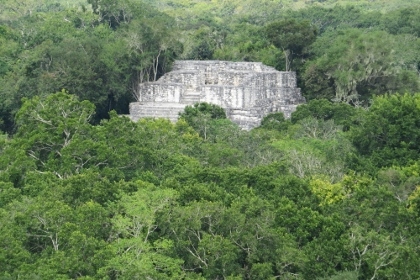 In its time, Calakmul was the rival of Tikal. The site was not rediscovered until 1931. The ruins of the ancient settlement consist of three groups of structures, with public open spaces and platforms with buildings. Its major monument, the pyramid temple Structure 2, is one of the most massive structures built in the Maya world. I love remote sites! 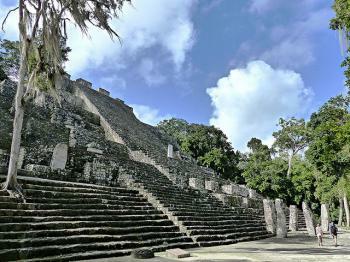 And who can withstand the experience of watching a WH-listed ancient Maya ruin with background noise of howler monkeys? Calakmul is as much a natural site as it is cultural, although it was inscribed as a cultural WHS only. It lies in the Calakmul Biosphere Reserve in the south of Yucatan peninsula, which is the largest nature reserve of Mexico. It’s a 110km / 2 hour drive from the nearest decent accommodation. At the turnoff from the main road, you first have to pay an entrance fee to the park and then you can drive on into the jungle. It’s the kind of road where you expect an oncilla sprinting across it at any moment (it didn’t happen, of course). After about 20km I arrived at the visitor center. A nice place to stop for a quick look, and it’s also the last place where they sell drinks and snacks. They have a few Mayan objects on loan from the Museum of Antropology, the rest of the presentation is geared to the landscape. The final 40km is on a much worse road: it’s paved but it has a lot of potholes. It took me an hour to get there, fortunately there are few other visitors so you can drive on any side of the road. The small parking area probably is a sign how few visitors come here, there’s room for 20 cars at most. Signing up in the guest book, I was the second visitor of the day (ca. 10 a.m.). You can be so unlucky though to encounter a large tour group: at my hotel both nights large European tour groups were staying (Danish, German) and they obviously had visited Calakmul too. Entrance fee is 45 pesos (2,5 EUR), and you even don’t get a ticket for that (let alone a brochure or something). You just have to follow the trail with the painted arrows. I walked the jungle trail completely alone and that was a good hike. Before having seen one of the ruins, I already stumbled upon a troop of monkeys. I saw the brushes moving and knew I just had to be patient to get a glimpse of them.. 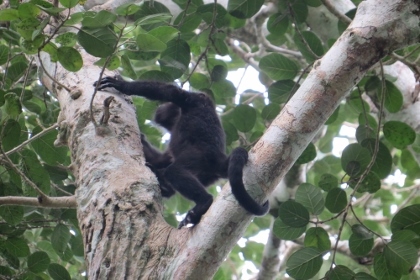 They were Geoffroy's spider monkeys, with a black face and brownish back. Great to watch, they were having their breakfast. The trail is divided in short, medium and long branches, but I have no idea what that means (how long is long? What do you miss following only the short trail?). This is the only criticism I have of this site: signposting is as erratic as on the Mexican roads: signs can be forgotten, pointing both ways etc. The main area is the Central Plaza, which has structures on all four sides. They’ve not cut the trees around the structures so it still has the atmosphere as if you’ve just stumbled upon them in the jungle. The stelae for which the WHS is particularly known are present everywhere, just like rows of columns in an Ancient Roman archeological site. The decorations on them mostly have eroded. The structures themselves aren't big on decoration either. At the back of the Central Plaza the trail leads to the highest structure of the complex, the Great Pyramid or structure no. 2. It is over 45m high. I decided this would be the one to climb this day – climbing is still allowed here and the stairs are in pretty good shape. From a previous experience in 1997 (I don’t remember where it was, Teotihuacan?, Palenque?) I remember that it is very steep and especially scary to go down. But I pushed on this time and it wasn’t that hard. And there was noone around to see me climbing up slowly. The views are what you hope for: at the top of the pyramid you’re above the level of the forest canopy and you can see far, very far. You can apparently see other Mayan structures in Guatemala, but I did not know which way to look. 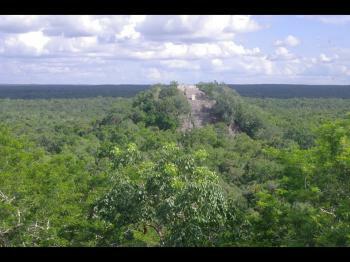 But I did see some parts of Calakmul. When I climbed down I heard the noise of howler monkeys. This unmistakenable sound I know so well from red howler monkeys in Peru and Guyana, where it is the wake-up call at 5 a.m. These ones were a little late around noon. I went to the source of the noise, and stood under the tree they were hanging out in. I’ve always found howler monkeys difficult to see, they don’t move around as other monkey species. But with some patience and endurance of the sound piercing my ears, I saw black bottoms, black limbs and finally also a large black head like a gorilla peeking down at me. These are Guyanan/Yucatan black howler’s, another new mammal species for me and the fourth new species during my stay in this area (I saw an agouti and a little fox near my hotel in Chicanna). After a 2.5 hour visit I was fullfilled, and prepared for the long drive back. But this is surely a WHS "worth a journey". Calakmul is one of those places that take people directly into one those famous American adventure movies. Hidden in the middle of a huge forest, it offers a great experience, combining culture and nature, to the brave souls willing to see it. Reaching Calakmul is not an easy thing. There is only one road leading to the site. This road, if we can call it a road or a path, is already an adventure in itself. Full of holes, surrounded by forest, you can easily meet animals while driving, especially considering that you cannot speed anyway. Among the animals we saw in the site and on the way, we can mention many monkey, a coral snake, many ocellated turkeys, few wide pigs, few lizards and of course many birds. 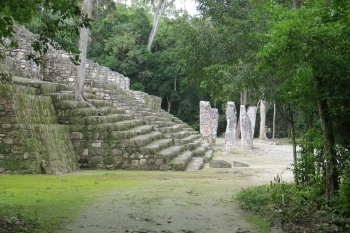 To access the path leading to Calakmul, people must take the road linking Villahermosa. via Escarcega, to Chetumal. If you come from Escarcega, you have to drive on this road until the small village of Conhuas. Cross the village and few hundred meters after the end, you will find, on your right, the entry to the Calakmul path, with a guard to which you have to pay an entrance fee. This entrance is badly indicated so be careful. There must be a checkpoint at the very beginning. If there is none, you are probably on the wrong road. Once on the Calakmul path, there is a 60 km trip to reach the ruins. Considering the state of the road, it may fairly take 1,5 to 2 hours to reach the small parking of the site. You will also see one or two additional checkpoints with guards to which fees have to be paid. An important tip, if you drive your own car, is to have enough fuel, given that from Escarcega to Chetumal, there are very few gas stations, mostly located in Xpuhil town. The ruins are in a less good state than the ones people can see in Chichen Itza, Uxmal or Palenque, but offer this unique sensation of being untouched since their discovery. Nature is playing a key role is this experience. Finally, climbing on some of the highest pyramids offers a great view on the forest. From there, you see nothing but trees, no human presence. Making plans to come back soon ! I visited this WHS in December 2015. Some say that it's all about the journey, not the destination. To me Calakmul truly deserves it's place on the list and is a very good example of how a mixed WHS should be. You won't end up in Calakmul by chance. The Mayan ruins are in the middle of the biosphere reserve on the forest border with Guatemala. I'd suggest getting to the Rio Bec Mayan cluster close to Chicanna/Becan/Xpuhil and visiting these ruins first and sleeping over to visit Calakmul first thing in the morning. I marvelled at House of the Serpent Mouth in Chicanna and spent a lovely afternoon exploring practically alone for hours on end. I was at the entrance to the 70km road to the site at around 07:30 and it turned out to be a wise choice. The road is full of potholes and turns and quite narrow at times to be a 2 way road. Being there early meant I could drive on without having to slow down because of other vehicles in the opposite direction (which I experienced on my way out!). The highlight of the ruins are the several carved stelae beneath the 'pyramids'. Climbing to the top is still allowed and it's a great experience to be high above the forest canopy and have a panoramic view of the biosphere. The peak of the recently discovered El Mirador in Guatemala can be seen on a sunny day and with binoculars. Structure 2 is one of the tallest Mayan ruins in Mexico and a small tip to help you climb up and down safely is to go up and down in a zig zag pattern not straight up and especially not straight down. There's no rope to help you like there is in Coba for example but the view is certainly worth the effort and to me the best forest view you can get from any Mayan ruin in Mexico. The biosphere is full of interesting birdlife and lots of elusive fauna. The loud howler monkeys echo all over the place and can be easily spotted while the quick black handed spider monkeys are a bit more difficult to capture on camera! All in all this is one of my favourite Mayan sites mostly because it's more quiet than other more iconic Mayan ruins and because they can still be enjoyed to the full. Two years ago in December of 2007, my family and I took a driving tour of the Yucatan in Mexico. Calakmul is certainly the highlight. We spent an evening in the town of Campeche and drove to Calakmul the next morning. The drive goes through pristine forests and after you turn off the highway, you are entering the Calakmul Biosphere. You can definitely notice the bird sounds and we even had to stop to let a family of wild turkeys cross the road. The Mayan city of Calakmul is less restored than Chichen or Uxmal and so much more in its natural setting. There are no crowds of tourists unlike Chichen (thousands of tourist come to Chichen from Cancun by the bus loads just for the day) and we only saw a couple of other families there that day. The best part of Calakmul is that you can still climb the pyramids unlike Chichen and Uxmal where they are totally off limits. There are several that you can climb and we did the two highest. On the main pyramid, you will have a 360 degree view of the country side and we sat up there for nearly an hour just looking at the forest to the horizon. Unfortunately when it got too hot we had to descend to some shade. A local guide pointed out another pyramid in the southern direction in the distance which is Mirador just over the border in Guatemala. My understanding is that the World Heritage Fund is restoring Mirador and that they believe that it rivals Tikal and all other Mayan cities. Once completed and open to the public, I anticipate that Mirador will become another WHS. The last tidbit on Calakmul is that they discovered an opening on the main pyramid to another pyramid inside. They built the main pyramid over an older pyramid. Pictures show that the inner pyramid has very well preserved paintings and features. Unfortunately unless you are doing field work, the entrance is locked by a steel door and not open to the public. Stelae: Calakmul is especially noteworthy for the large number (120 to date) of stelae that have been found on the site. Several of those are still in situ, others at museums. Built in the 6th century: The apogee of Calakmul is considered to have been in the Late Classic Period (542-695 CE). There are a few remaining earlier structures.